The steep drop in the incomes of non-citizen households is distinct from income trends among other groups. 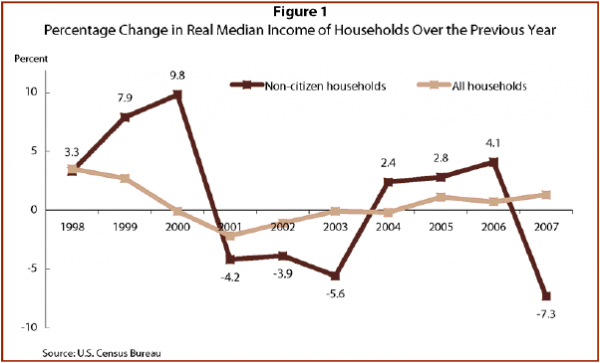 Median real income of non-citizen households declined from $40,617 in 2006 to $37,637 in 2007, or by 7.3%.7 The median income of naturalized citizen households also declined, but their loss of 1.5% appears minimal in comparison. In contrast, the median annual income of all U.S. households increased 1.3%, from $49,568 in 2006 to $50,233 in 2007 (Table 1). While the increase was modest, it was an improvement over the preceding year—from 2005 to 2006, household income in the U.S. increased only 0.7%. Non-citizen household incomes increased rapidly from 1998 to 2000, as the economy reached the peak of an historic expansion. The incomes of non-citizen households increased 3.3%, 7.9% and 9.8% successively, in the three-year period from 1998 to 2000. The income gains made by non-citizen households during peak years of the economic expansion began to reverse as the economy entered a recession in 2001. The incomes of non-citizen households fell 4.2% in 2001 and decreased an additional 3.9% and 5.6% in 2002 and 2003. Figure 1 also shows the trends in income for all U.S. households. Fluctuations in the incomes of all households are far less severe than in the incomes of non-citizen households. The highest increase for all U.S. households was 3.5% in 1998 and the largest drop was 2.2% in 2001.